Air pollution and climate change are different phenomena, but are connected in a number of ways. The same sources emit both air pollutants and greenhouse gases, many air pollutants affect the Earth’s energy balance and thereby affect climate change, and a changing climate will affect air quality. Policy options to address either air quality or climate change cannot be formulated and applied in isolation, as most will often affect emissions of both greenhouse gases and air pollutants. This article outlines the basics of what air pollutants and greenhouse gases are, how they affect air quality and climate change, and where they come from. The connections between these two environmental phenomena are also addressed. On September 30, 2015, Stephen Colbert’s Late Show covered Chinese President Xi’s announcement that China would address its greenhouse gas emissions. Colbert followed this up by stating that the agreement was a response to the ‘growing public anger about the noxious air that often envelops Chinese cities’, and jokingly stating that the first step to reducing their emissions would be ‘trading in their Volkswagens,’ a reference to the recent emissions testing cheating scandal [“The Late Show with Stephen Colbert: China finally wants to clear the air”, 2015]. While these all have to do with emissions into the atmosphere, these various headlines he brought together are addressing different issues: air pollution and climate change. As someone who spends their days thinking about air pollution as well as climate change, I find examples such as this both encouraging (that it is being covered in the popular media), and discouraging (that – at least in this case – the science behind these issues isn’t fully understood by the media). Let’s consider Colbert’s statements in a bit more detail. The major greenhouse gas responsible for climate change is carbon dioxide (CO2). CO2, however, is not an air pollutant because it doesn’t have any direct effect on human health, and therefore any changes in CO2 emissions will not have an effect on the ‘noxious air’. The emissions for which Volkswagen installed software to cheat the emissions testing system was for nitrogen oxides (aka NOx), which is an air pollutant, but not a greenhouse gas. Reducing the NOx emissions would therefore not have a significant effect on global climate change. However, one could characterize air pollution and climate change as ‘two sides of the same coin’ – different but closely related – as this article will go on to explain. Air pollution and climate change are indeed different phenomena, but they are affected by many of the same things: 1. emissions sources such as automobile exhaust, energy production or industry; 2. the properties and chemical processes affecting the emitted compounds; 3. policy options to reduce or mitigate these emissions. What are air pollutants and why are they important? Air pollutants are typically regulated by governments around the world because of their adverse effects on human health and ecosystems [“http://www3.epa.gov/airquality/urbanair/“, 2015]. These regulations limit the amount of pollutants that can be emitted into or are allowed to be in the air. For example, the World Health Organization has recommended limits based on studies of adverse human health effects for a number of air pollutants including particulate matter, ozone, nitrogen dioxide, and sulfur dioxide [WHO, 2006]. Air pollutants are typically grouped based on whether they are gases (e.g. ozone and nitrogen dioxide) or solids (e.g. particulate matter). In addition, some pollutants are emitted directly into the atmosphere from a variety of sources, so they are referred to as “primary pollutants”. Other pollutants are formed in the atmosphere from primary pollutant emissions, these are referred to as “secondary pollutants”. For example, ozone, the main component of ‘smog’, is not emitted directly; rather, it is formed in the atmosphere from nitrogen dioxides and volatile organic compounds (VOCs) like benzene, among other gas-phase pollutants. Primary pollutants such as carbon monoxide or methane can also be formed “secondarily” in the atmosphere as a result of chemical reactions. Ozone’s relevance as a “secondary pollutant” comes from the fact that in order to control the concentrations of ozone in the air, concentrations of the primary pollutants (VOCs, NOx, etc) have to be reduced. Particulate matter (PM) includes a variety of different pollutants including, but not limited to: organic carbon, black carbon, sulfate (from sulfur dioxide), nitrate, mineral dust, and sea salt. The composition of PM varies depending on the environment and sources of pollutants. For example, the composition of PM in the middle of a megacity such as Jakarta will be different from that in the middle of the Sahara. PM is typically referred to and regulated based on its size (PM1 – smallest; PM2.5 – moderate size; PM10 – largest). These designations refer to the particles’ diameters – 1, 2.5, and 10 µm and smaller, respectively. Similarly to the gases, particles can be emitted directly (“primary”) or formed in the atmosphere (“secondary”). Air pollutants are bad for human health. Air pollution contributes to premature mortality and morbidity, pulmonary disease, asthma, and other respiratory illnesses. The vast majority of adverse health effects from air pollution can be attributed to particulate matter, with a much smaller proportion of ill effects attributed to ozone [M. R. Heal et al., 2012] [S. S. Lim et al., 2012]. The Global Burden of Disease study attributed 3.3 million deaths to outdoor air pollution in 2010 [S. S. Lim et al., 2012]. Smaller particles are a greater health concern than larger ones, not least because smaller particles travel farther into the lungs and even into the bloodstream. There is also variability within specific particle sizes depending on their composition: initial studies suggest that long-term exposure of PM2.5 containing a high black carbon fraction may have larger mortality effects than other PM2.5 mixtures [K. R. Smith et al., 2009]. Carbon dioxide (CO2) is the most important greenhouse gas for climate change. Other greenhouse gases include methane, halocarbons (CFCs, HCFCs), nitrous oxide (N2O), and even ozone. Ozone is both an air pollutant and a greenhouse gas. Greenhouse gases (GHGs) alter the energy balance of the Earth, which in turn drives climate change. Radiative forcing is a measure of this change in the net energy balance [T. F. Stocker et al., 2013]. Greenhouse gases in the atmosphere can be compared to a blanket covering the planet. Just like blankets keep you warm at night, the GHG blanket around the Earth regulates the temperature of the Earth. But now, we’ve been adding thickness to this blanket in the form of increased GHG emissions, thereby causing global warming. But unlike the blankets on our bed, we can’t just remove them when it gets too hot. The top bar in Figure 1 indicates the amount of radiative forcing that CO2 has contributed to since pre-industrial (1750**) times. What are the emission sources of air pollutants and GHGs? Air pollutants and greenhouse gases are emitted from many of the same sources. Fossil fuel combustion is a dominant source for both. The transportation sector – specifically cars – is a significant source of emissions of CO2, particulate matter, nitrogen oxides, carbon monoxide, and volatile organic compounds. Similarly, energy generation and use is also a significant source of CO2 emissions, as well as PM, sulfur dioxide, and nitrogen oxides [E. von Schneidemesser et al., 2015]. The amount of pollutants emitted in these situations depends on governmental regulations – sulfur dioxide emissions from coal fired power plants were capped in the US by the Clean Air Act in the 1990s. At this point, sulfur dioxide emissions from power plants in the US and Europe are minimal compared to Asia, where the sulfur content in fuels and fuel gas controls are much less regulated. In addition, biomass burning, whether from residential combustion (burning wood in a fireplace), waste burning, or naturally occurring forest fires, is also a significant source of not only CO2, but also particulate matter including organic carbon and black carbon, carbon monoxide, and nitrogen oxides. Agriculture is a significant source of methane, specifically from cows and rice cultivation, but also as a source of volatile organic compounds and particulate matter. How long do GHGs and air pollutants stay in the atmosphere and why is that important? How long air pollutants or greenhouse gases stay in the atmosphere is often referred to as their “lifetime”. The lifetime of air pollutants ranges from hours to months. The end of their “lifetime” comes when they are either rained out, naturally settle out because of gravity, or react with other pollutants in the atmosphere to create something new. The lifetime of the greenhouse gas CO2, for instance, is of the order of a century. Other greenhouse gases such as halocarbons (CFCs or HCFCs) or nitrous oxide (N2O, aka laughing gas) range from a couple of years to hundreds of years. Methane falls right in the middle, with a lifetime of about a decade. Atmospheric lifetime is important because it determines the scale of the problem – how far the pollutants or GHGs can be transported by winds. Global circulation patterns mean that longer-lived gases – those in the atmosphere for a number of years – will become mixed across the hemisphere. When the lifetime is even longer, they will end up distributed all over the globe, like CO2 [J. H. Seinfeld and S. N. Pandis, 2006]. Air pollutants with much shorter lifetimes don’t often make it beyond the immediate surroundings from where they were emitted before being removed from the air. This is why the extreme air pollution in China remains a largely Chinese and Asian problem, whereas CO2 emitted in China or elsewhere is a global issue. Thus, if China decided to drastically reduce emissions of air pollutants, as it did during the Beijing Olympics, significant improvements would be visible within days to weeks. In contrast, the lack of international action toward reducing CO2 means that the effects of climate change will continue to be a global issue with increasingly detrimental effects for generations to come. Even if we started reducing CO2 emissions immediately the effect on climate change (warming) wouldn’t be felt for roughly a century due to its lifetime. How do air pollutants affect climate change? Some air pollutants also have an effect on climate change. For example, as mentioned earlier, ozone is both an air pollutant and a greenhouse gas. However, because of its short lifetime in the atmosphere (ca. weeks), reducing ozone would lead to relatively immediate reductions in the warming – like shedding a layer of the blankets. The bars in Figure 1 show the amount of change to the radiative forcing that pollutants and greenhouse gases have contributed since 1750 to the present (2011) [G. Myhre et al., 2013]. 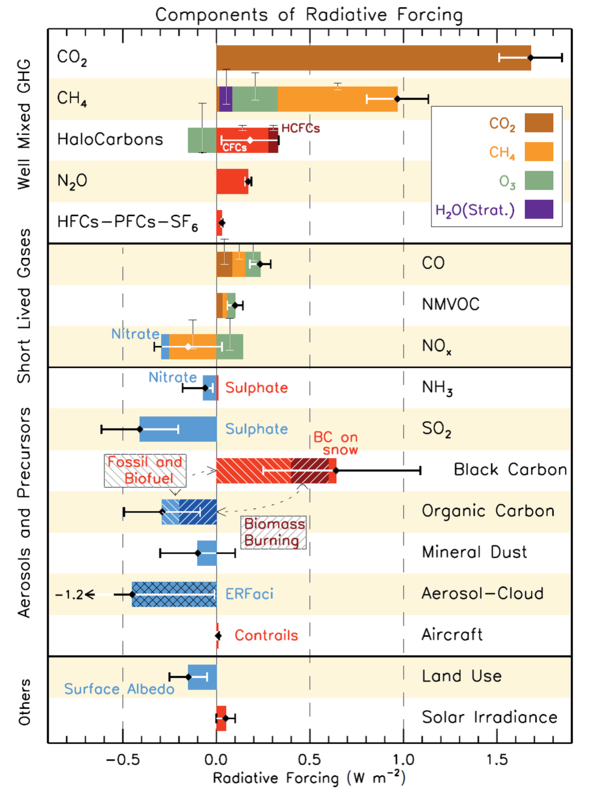 In the Figure, “primary” emissions are labeled with the black text next to the bars. The effect that these primary emissions, e.g. CO2 or CO, have had on radiative forcing (warming or cooling) is depicted by the length of the horizontal colored bars. As indicated earlier, CO2 (the top bar in brown) has the largest bar, indicating that it has had the largest effect on radiative forcing, which is why it is of primary concern for addressing climate change. Carbon monoxide (CO; 6th bar from the top of the Figure) has had a much smaller effect on radiative forcing, as indicated by the much shorter bar. CO itself is not a greenhouse gas. Therefore, it does not have a direct effect on radiative forcing. However, it contributes to the formation of secondary pollutants such as ozone that do effect radiative forcing, and because of this, its bar is composed of multiple colors reflecting CO2 (brown), methane (orange), and ozone (green), gases that CO influences to affect radiative forcing. The top-most section of the plot shows the amount of radiative forcing from GHGs. The middle two sections include the gas-phase air pollutants, and the components contributing to particulate matter (labeled here as ‘aerosols and precursors’). Aerosols refer to the mixture of solids, liquids, and gases that also contain particulate matter. Aerosols or particles affect the radiative forcing of the atmosphere through their effect on light absorption and scattering. Generally, the darker particles absorb incoming radiation (including sunlight), contributing to warming (red bars to the right), while the lighter particles scatter incoming radiation, thereby contributing to cooling (blue bars to the left) [E. von Schneidemesser et al., 2015]. This can be compared to the different temperatures one might notice if walking barefoot in summer. For example, a blacktopped parking lot would be much warmer on bare feet than white paving stones or concrete. While most aerosol components contribute to cooling, such as organic aerosol and mineral dust, black carbon – the primary component of soot – contributes significantly to warming. This is particularly relevant in snow covered areas, such as the polar regions or the Himalaya, where black carbon deposited onto highly reflective surfaces (e.g. white snow or ice) can reduce the amount of reflected sunlight, accelerating melting. This can lead to a feedback process that causes further warming, as shown in Figure 2 [E. von Schneidemesser et al., 2015]. Consider, for example, the case of Asia and the Himalayan glaciers. Black carbon or other dark colored particles emitted from vehicles, open fires used for cooking and heating, or brick kilns in Asia are transported (blown by the wind) north toward the Himalaya, where these dark particles are then deposited onto the glaciers. These dark particles decrease the reflective properties of the snow and ice surface, which means that more sunlight is absorbed than usual, and this leads to an increase in the temperature. This in turn can cause further melting, etc. This is known as a “feedback loop”. Such a process, of which there are many, are ways in which air pollutants influence climate change, particularly those relevant to regional scale climate change. Figure 2. The feedback loop from increased particulate matter emissions, specifically darker particles such as black carbon, and the effect on climate change and ecosystems. The changes to the hydrological cycle also have implications for human health. Figure reproduced from [E. von Schneidemesser et al., 2015]. How does climate change affect air pollution? Not only do air pollutants affect climate change, but a changing climate will also affect air pollution. For example, ozone, as a “secondary” pollutant, is formed in the atmosphere from chemical reactions of primary pollutants in the presence of sunlight and warm temperatures. Under a warmer climate, conditions will favor ozone production and concentrations are expected to increase. Generally, future climate conditions will make it harder to achieve a given air quality goal. This means that greater emission reductions will be needed under a future climate compared to those needed today to reach the same target [S. Wu et al., 2008]. Figure 3 provides a nice summary of the ‘two sides of the same coin’ aspect of air pollution and climate change, by considering the implications of changing concentrations of GHGs and air pollutants in the atmosphere. From left to right in the graphic, human activities, such as driving and energy consumption, lead to increases in emissions of both GHGs and air pollutants. These emissions pollute the air and change the Earth’s energy balance. These in turn increase the global temperature, change weather patterns, harm human health, and damage crops and ecosystems. An awareness of both of these environmental issues, their causes and consequences, should be used to inform policy decisions since not all options are created equal. For example, encouraging diesel car use to reduce CO2 emissions, has led to unfortunate side effects for air quality, specifically for emissions of nitrogen oxides and PM. There are however, “win-win” options that would benefit both environmental issues, such as energy efficiency and renewable energies, such as wind or solar power [M. Williams, 2012]. The atmosphere is a part of the global commons, and modern civilization has caused significant changes to its composition. Understanding that many sources emit both greenhouse gases and air pollutants, and that air pollutants affect climate change and vice versa is crucial for how air quality and climate change are approached from a policy perspective. Acknowledging these linkages and recognizing that it is important to address these issues in a coordinated way can foster informed decisions that avoid trade-offs and take advantage of synergies among mitigation options. This is true not only for policy makers, but all of us. We can all act to improve our air quality and mitigate climate change – by cycling or walking instead of driving, and when we choose to drive, by maintaining the vehicles we drive to make sure they meet the emission standards and considering efficiency in our choices when we purchase them; by choosing wind and solar energy, and if we use a fireplace for residential heating by choosing efficient combustion technologies to minimize air pollutant and CO2 emissions. It also presents an opportunity on a grand scale for research and development to tackle these societal challenges, such as the redesign of our cities toward zero emissions targets, the transition to renewable energy options, and the transformation to a sustainable society. Figure 3. The implications of changes in atmospheric composition, specifically GHGs and air pollutants, for climate change, human health, and ecosystems. Figure reproduced from [E. von Schneidemesser et al., 2015]. The Late Show with Stephen Colbert: China finally wants to clear the air. [Video file]. Retrieved (30 09 2015) from https://www.youtube.com/watch?v=_w4x2qez138. US Environmental Protection Agency. Retrieved (10 2015) from http://www3.epa.gov/airquality/urbanair/. M. R. Heal, P. Kumar and R. M. Harrison: Particles, air quality, policy and health, Chemical Society Reviews, vol. 41, 6606, 2012. S. S. Lim, T. Vos, A. D. Flaxman, G. Danei, K. Shibuya, H. Adair-Rohani, M. A. AlMazroa, M. Amann, H. R. Anderson and co-authors: A comparative risk assessment of burden of disease and injury attributable to 67 risk factors and risk factor clusters in 21 regions, 1990-2010: a systematic analysis for the Global Burden of Disease Study 2010, The Lancet, vol. 380(9859), 2224-2260, 2012. G. Myhre, D. Shindell, F.-M. Bréon, W. Collins, J. Fuglestvedt, J. Huang, D. Koch, J.-F. Lamarque, D. Lee and co-authors: Anthropogenic and Natural Radiative Forc­ing, in: Climate Change 2013: The Physical Science Basis. Contribution of Working Group I to the Fifth Assessment Report of the Intergovernmental Panel on Climate Change, T. F. Stocker, D. Qin, G.-K. Plattner, M. Tignor, S. K. Allen, J. Boschung, A. Nauels, Y. Xia, V. Bex and co-editors (Eds.). Cambridge University Press, 659-740, 2013. E. von Schneidemesser, P. S. Monks, J. D. Allan, L. Bruhwiler, P. Forster, D. Fowler, A. Lauer, W. T. Morgan, P. Paasonen and co-authors: Chemistry and the Linkages between Air Quality and Climate Change, Chemical Reviews, vol. 115, 3856-3897, DOI: 10.1021/acs.chemrev.5b00089, 2015. J. H. Seinfeld and S. N. Pandis: Atmospheric Chemistry and Physics, From Air Pollution to Climate Change (ed. 2). John Wiley & Sons, Inc., 2006. K. R. Smith, M. Jerrett, H. R. Anderson, R. T. Burnett, V. Stone, R. Derwent, R. W. Atkinson, A. Cohen, S. B. Shonkoff and co-authors: Public health benefits of strategies to reduce greenhouse-gas emissions: health implications of short-lived greenhouse pollutants, The Lancet, vol. 374, 2091-2103, 2009. T. F. Stocker, D. Qin, G.-K. Plattner, L. V. Alexander, S. K. Allen, N. L. Bindoff, F.-M. Bréon, J. A. Church, U. Cubasch and co-authors: Technical Summary, in: Climate Change 2013: The Physical Science Basis. Contribution of Working Group I to the Fifth Assessment Report of the Intergovernmental Panel on Climate Change, T. F. Stocker, D. Qin, G.-K. Plattner, M. Tignor, S. K. Allen, J. Boschung, A. Nauels, Y. Xia, V. Bex and co-editors (Eds.). Cambridge University Press, 33-116, 2013.
WHO: WHO Air Quality Guidelines for Particulate Matter, Ozone, Nitrogen Dioxide and Sulfur Dioxide – Global Update 2005, vol. WHO/SDE/PHE/OEH/06.02, WHO (Eds.). World Health Organization, 2006. M. Williams: Tackling climate change: what is the impact on air pollution?, Carbon Management, vol. 3, 511-519, 2012. S. Wu, L. J. Mickley, D. J. Jacob, D. Rind and D. G. Streets: Effects of 2000-2050 changes in climate and emissions on global tropospheric ozone and the policy-relevant background surface ozone in the United States, Journal of Geophysical Research, vol. 113, D18312, 2008. Next PostNext What do historical temperature records tell us about natural variability in global temperature? Cite as: Erika von Schneidemesser, Can somebody clear the air? How air quality and climate change are connected., Climanosco, 24 Aug. 2016.